The 28 graduates of the A.A.S. in nursing program at Cayuga Community College received their official nursing pin in a May 20 ceremony in the Irene A. Bisgrove Community Theatre on the Auburn Campus. 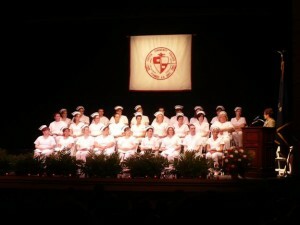 Professor Linda Alfieri (right), director of the nursing program, addresses the graduates. The 28 graduates of the A.A.S. in nursing program at Cayuga Community College received their official nursing pin in a May 20 ceremony in the Irene A. Bisgrove Community Theatre on the Auburn Campus. The pinning ceremony dates back to the crusades when a symbol on knight’s armor identified those who protected the sick and dying. Alfieri described the “science” of nursing and the technical, critical thinking, and problem-solving skills students learned. Then she focused on the “art” of nursing. Graduates Brandi Coe and Melissa Holmes delivered the Nursing Class of 2011 address and shared memories of the long nights of studying together. Vice President of Academic Affairs and Student Development Anne Herron served as the host during the evening, which featured a welcome from College President Daniel P. Larson. He asked the graduates to remember drawing blood for the first time, creating their first patient-care plan, and fighting their way through anatomy and physiology. Chairman of the College Board of Trustees John Camardo and Cayuga County Legislator Ann Petrus also addressed the graduates. Petrus, a retired registered nurse, addressed the graduates directly and reminded them of their roles not only in the healthcare system but also in the lives of their patients and families. The pinning ceremony sounds interesting and memorable, i wish my school offered such rituals.